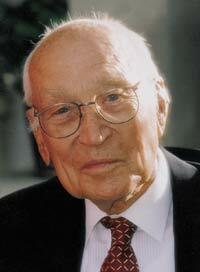 Arnold Beckman was an inventor, an industrialist, an academic, and a philanthropist. Raised in a family of modest means, he made most of his own toys in childhood, and converted a small shed on his family's property to a chemistry lab before his eleventh birthday. By early adolescence he was working as almost a chemist, conducting Babcock tests to analyze the quality of butter and cream for a local dairy. He took university-level chemistry classes while still in high school, then studied chemistry at the University of Illinois and Cal Tech, where he joined the faculty after earning his doctorate. In 1935 he invented the acidimeter, now called a pH meter, a device which measures the acidity or pH (potential of Hydrogen) factor in fruit or other materials. His intent was mostly to help a friend who worked for the California Fruit Growers’ Association, and needed a machine to better measure the acidity of lemon juice. When the friend returned, though, and asked for a second acidimeter, Beckman recognized the potential and founded National Technical Laboratories to manufacture the devices. He soon invented two spectrophotometers, used to analyze substances using light, and quit his day job at Cal Tech in 1940. In 1950 the company changed its name to Beckman Industries, and over subsequent decades its product line included electrical resistors, radar equipment, microcircuitry, heart monitors, and liquid crystal digital displays. He provided the seed money for William Shockley, inventor of the transistor, to establish Shockley Semiconductor in Palo Alto, California, beginning the transformation of the area south of San Francisco into the high-tech zone that is now called Silicon Valley. In 1977 he and his wife established the Arnold and Mabel Beckman Foundation, which supports chemistry-related research and gives large grants to charitable, educational, and non-profit groups. Beckman Industries became Beckman Coulter after its 1997 acquisition of Coulter Corporation, and remains a world-wide leader in scientific instruments. Beckman died in 2004 at the age of 104, but his name lives on in myriad halls, laboratories, institutes endowed by the Beckman Foundation that bear his name. He is also remembered as the staunch Republican who convinced his friend, Ronald Reagan, to give up show business in 1966, and run for Governor of California. Scripps Green Hospital, La Jolla, CA.